The Open Group has announced this week the availability of two new industry standards to integrate fundamental elements of service oriented architecture (SOA) and cloud computing into a solution for enterprise architecture (EA). The new standards are: SOA Reference Architecture (SOA RA) and the Service-Oriented Cloud Computing Infrastructure Framework (SOCCI). ROA RA is a blueprint for creating and evaluating SOA solutions, while SOCCI is the first Open Group cloud standard that outlines the concepts and architectural building blocks necessary for infrastructures to support SOA and cloud initiatives. "In today's global competitive marketplace it is imperative that business and IT drivers are aligned," said Chris Harding, Director for Interoperability, The Open Group. "Each of the three standards is vendor-neutral and helps an organization of any size to design and implement the proper SOA and cloud solutions for its business objectives." SOA RA is an industry standard reference architecture for the development of SOA solutions. Utilizing the SOA RA Standard, enterprise architects will have a common language and approach for creating SOA solutions that meet different organizational needs and bridge the gap between business and IT. SOCCI is the industry's first cloud standard for enterprises that wish to provide infrastructure as a service in the cloud and SOA. Developed by The Open Group SOA and Cloud Work Groups, SOCCI is the realization of an enabling framework of service-oriented components for infrastructure to be provided as a service in SOA solutions and the cloud. The standard details a set of common SOCCI elements and management building blocks for organizations to consider and identifies the synergies that can be realized through cohesive application of SOA and cloud-based principles. Using SOCCI, organizations can incorporate cloud-based resources and services into their infrastructure for increased agility and scale, and lower maintenance costs. OSIMM leverages proven best practices to allow consultants and IT practitioners to assess an organization's readiness and maturity level for adopting services in SOA solutions. By aligning business goals and assessing associated SOA services IT practitioners can create a detailed roadmap for integrating services for SOA and cloud computing solutions into enterprises. With the recent ratification of OSIMM 2.0 by ISO and IEC, organizations worldwide have an extensible framework for understanding the value of implementing a service model, as well as a comprehensive guide for achieving their desired level of service maturity. Each of the three standards is vendor-neutral and helps an organization of any size to design and implement the proper SOA and cloud solutions for its business objectives. The SOA RA technical standard, SOCCI framework, and OSIMM 2.0 International standard are available for download from The Open Group Bookstore. These new standards can also be viewed online at: SOA Reference Architecture, Service-oriented Cloud Computing Infrastructure, Open Group Service Integration Maturity Model. How EA can help the enterprise successfully adapt to "disruptive technologies" like cloud computing and ubiquitous mobile access. Among the speakers at the conference will be Andy Mulholland, the Global Chief Technology Officer and Corporate Vice President at Capgemini. In 2009, Andy was voted one of the top 25 most influential CTOs in the world by InfoWorld. And in 2010, his CTO Blog was voted best blog for business managers and CIOs for the third year running by Computer Weekly. 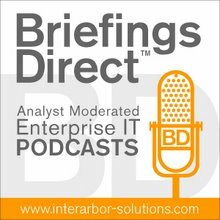 Andy recently participated in a BriefingsDirect podcast, in which he spoke about an upcoming Capgemini whitepaper, which draws distinctions between what cloud means to IT, and what it means to business -- while examining the complex dual relationship between the two. Also, Jeanne Ross, Director and Principal Research Scientist at the MIT Center for Information Systems Research. Jeanne studies how firms develop competitive advantage through the implementation and reuse of digitized platforms. Jeanne recently spoke with me about how adoption of EA leads to greater efficiencies and better business agility and explained how enterprise architects have helped lead the way to successful business transformations. Also speaking is Joseph Menn, Cyber Security Correspondent for the Financial Times and author of Fatal System Error: The Hunt for the New Crime Lords Who are Bringing Down the Internet. As a lead-in to his Open Group presentation, entitled "What You're Up Against: Mobsters, Nation-States, and Blurry Lines," Joe recently joined BriefingsDirect to explore the current cyber-crime landscape, the underground cyber-gang movement, and the motive behind governments collaborating with organized crime in cyber space. Registration remains open for The Open Group Conference in San Francisco, beginning Jan. 30.